Celebration Florals: Courtney and Jake are Married! Courtney and Jake are Married! We so enjoyed working with our first 2012 bride and her mother. They had a great vision for Courtney and Jake's wedding. Courtney had a vision of what she wanted her bouquet to look like. 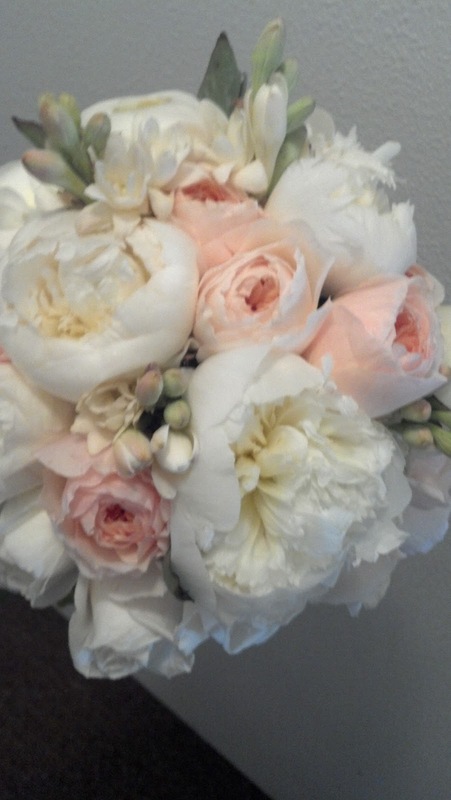 Peonies and garden roses in whites, creams, and peach. We loved the addition of tropical tuberose. This bouquet was heavenly scented. Soft, romantic, and lush. We loved our first bride of 2012! We loved that we were able to find her peonies! We think she loved them, too! Courtney's maids bouquets had white Avalanche garden roses, white peonys, tuberose and were collared with baby's breath and galax leaves. We loved these baby breath poufs that the bride wanted! This was the largest order of baby's breath that we have ever used at one time! Fun! How about a great job by the family to transform the large venue? There were between 700-800 tissue poufs everywhere! The ability to control lighting was a bonus. With the hanging twinkle chandeliers and candlelight, the space became magical! Up close and personal with poufs! More poufs! Loved the family's use of tulle and poufs to divide the space and provide the backdrop for the wedding party table. Thank you for selecting Celebration Florals! Thanks for stopping by our blog! We're Carol and Peggy, and are so thrilled to be creating floral designs for some of the most beautiful weddings in Oregon's Willamette Valley. Enjoy browsing through our recent posts, and then check out samples of our favorite floral creations on our web site. If you are planning a wedding, we would love to meet with you and be a part of creating floral designs to perfectly complement your special day! Contact us for more details or to arrange a consultation in our private studio. For the perfect diamond ring setting, see Split Shank Engagement Rings or Pave Engagement Rings. South Sea Pearl jewelry seen at Paspaley Pearls is beautifully stunning! These are the perfect complement to a Tungsten Carbide Wedding Bands for the groom. Alternatively, see Sterling Silver Lockets. Leo Ingwer provides a big selection of Halo Engagement Rings, Two Tone Engagement Rings, Cushion Cut Engagement Rings and Channel Set Engagement Rings. Plasma Lighting offers green technology for energy efficiency! Stay on top of your reading list with Book Reviews, and also study Christian Hospitality. Stay updated with the latest local information at Oregon News, for Oregon Small Business, Oregon Womens News, Oregon Agriculture, and Oregon Sports. A great alternative is Oregon News with Oregon Political News and Oregon Christian Religion. Find legal help with Bakersfield Attorney, or pictures of your marriage with Oregon Wedding Photographers.